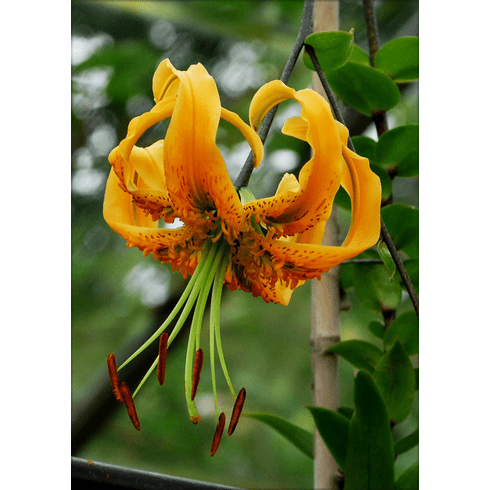 Photographed in August of 2007 at the nursery of Richard Hyde of the UK, speculation is, this could be a previously unknown lily. In an email from Mr. Hyde to Pontus Wallsten following a visit to his nursery, Mr. Hyde said "I am not sure now that they are L. henryi. He observed that the seed pods are smooth on this lily rather than being the typical trilobed pods that L. henryi is known for. Mr. Hyde went on to speculate that this could have possible been a natural hybrid between L. henryi and L. rosthornii, but said "such a hybrid, I would expect to flower before L. rosthornii; this is flowering later". Unfortunately this will forever remain a mystery as the bulb rotted the following year and attempts at taking a new scales for propagation also failed. Excepts taken from 'The Lily Species and Their Bulbs' by Pontus Wallsten, page 209.